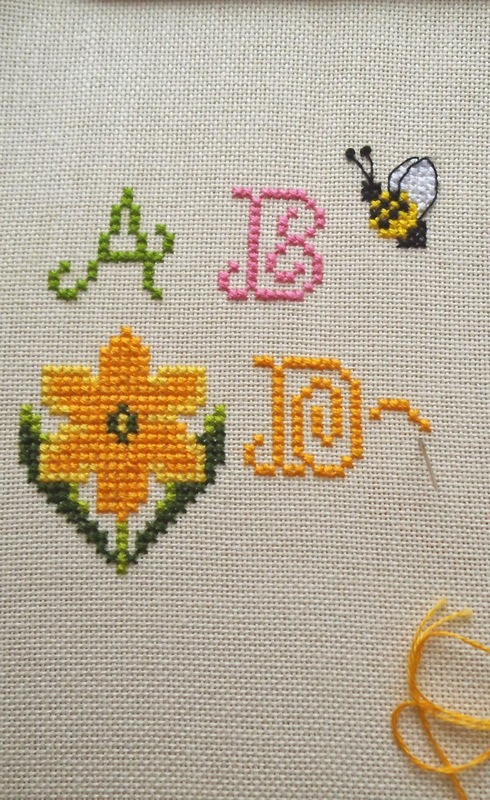 Stitchers Anon: Friday Feeling and exchange anyone? Friday Feeling and exchange anyone? Hi everyone. Thank you for your lovely comments on Holmsey's Easter. I do love him so: he is such a very cute character! So here we are on a Friday again! Yay! I'm loving this Friday because it is the last day of school and youngest son had two weeks off! I love the holidays! We went to his first ever parents evening this week and it went very well. Apparently DS is in the worst behaved class in the school and he is the only child to not have had a detention or gum cleaning punishment! Well done DS! Peer pressure is horrific when you are 13 but he sees to be doing very well and is apparently well behaved and polite. I'm not too concerned about the bad behaviour of his class: his school is very strict and I suspect their idea of bad behaviour would be considered normal in the places I taught in the Uk. DS went to an anti-bullying meeting when he first started school and he and his group were asked what they would do if they were being bullied. All the kids answered as expected: they would tell teachers, family members, their priest etc. The teacher got to Xander and he answered ' I would tell an assassin'. God bless his home educated roots! He is doing very well considering it is his first time in a school. His grades are good and apparently he is more aware of what is going on in the world than his peers seem to be. I think it is because he was home educated. We investigate and explored what DS was interested in and weren't restricted by a curriculum. I am one super proud mum that's for sure. So have I been super busy this week. Well yes, but not so productive. Hospital visits and parent's evenings seem to have put me out of kilter. Still, a wee bit was achieved. 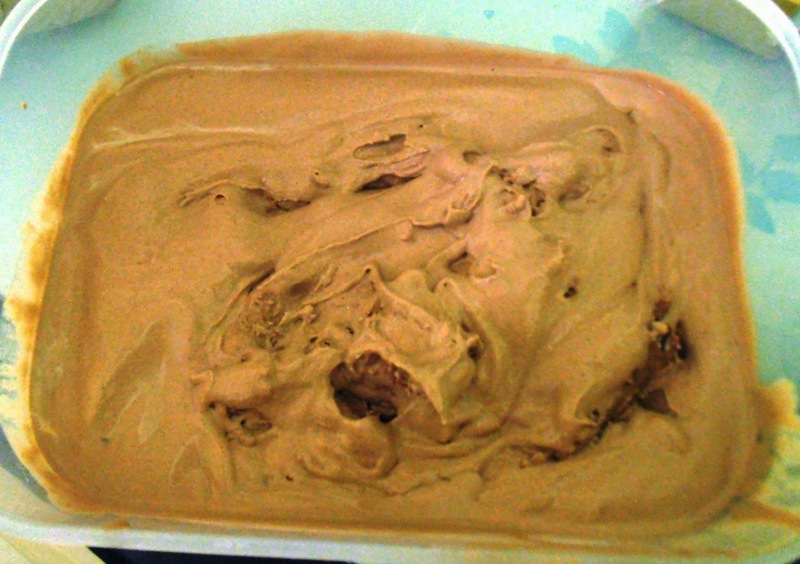 First off..chocolate icecream! Yum..super creamy and gorgeous. Two pinapple upside down cakes..mmm..sure they were whole when I left the kitchen to find the camera! Very dodgy light going on lol..these are actually a lovely golden brown. Apricot and honey cobblestones. 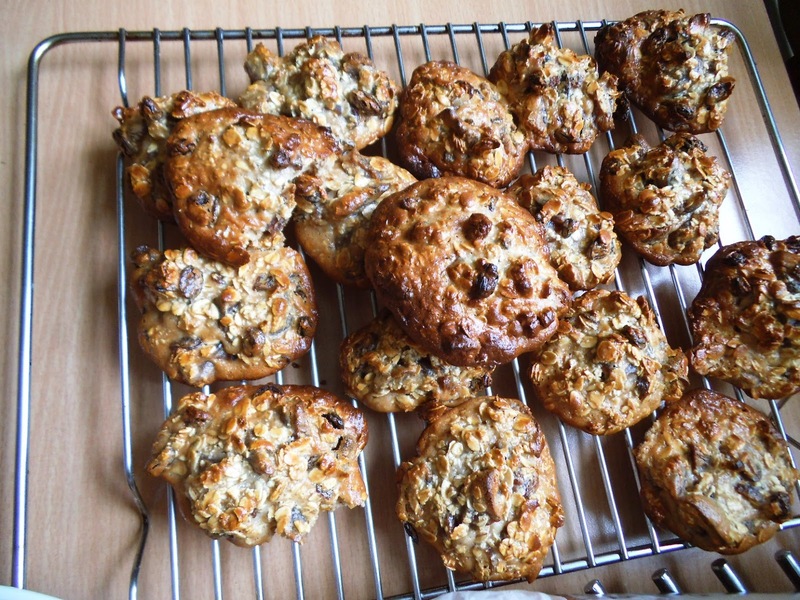 A cool USA recipe using condensed milk which makes these a little like super healthy flapjacks. That's what I'm telling myself cus I've just eaten three! 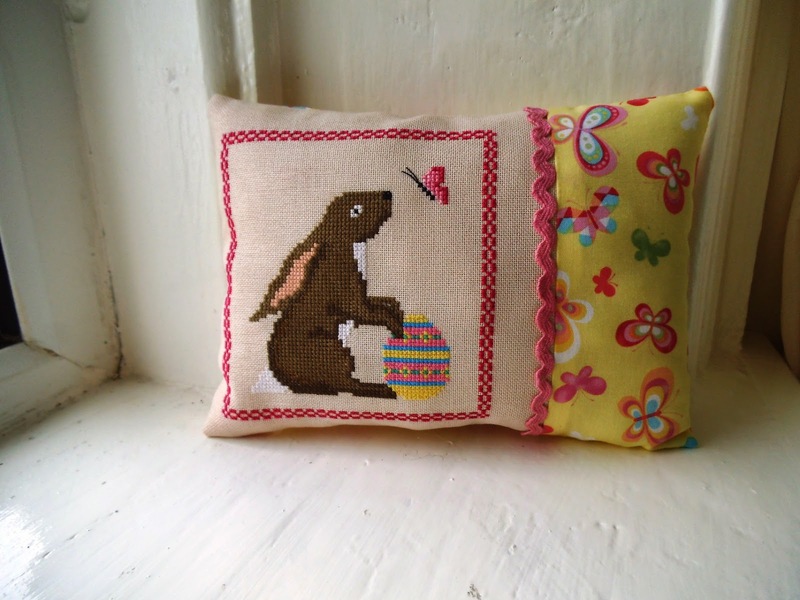 Holmsey Hare has been finished as a pretty little cushion and will be sent to his new home next week. And I have a new start. I'm really enjoying this one..who knows, I may even finish it by Monday! I have put the free Easter chart on the blog page, free charts so help yourself. These are mug rugs for the fund raiser..I was so pleased with how they came out. It got me thinking...would anyone fancy a mug-rug exchange? If there are a few of us we can all do a themed exchange. 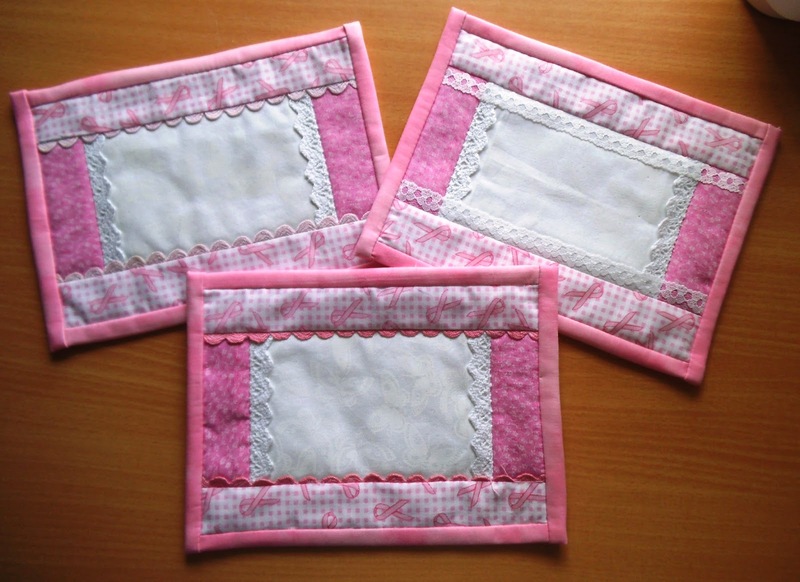 I am fairly new to sewing but these were quite easy. You can make it how you like and then you just send it to a designated partner? Perhaps we can send a mug rug, a traditional sweet/chocolate for your area and a postcard to show where you live. Just leave a comment if you are interested and email me with your address and details and I will sort it out. Right..thats me all done. I am going to try and have a super productive but relaxing weekend. I hope you all get a perfect weekend too! 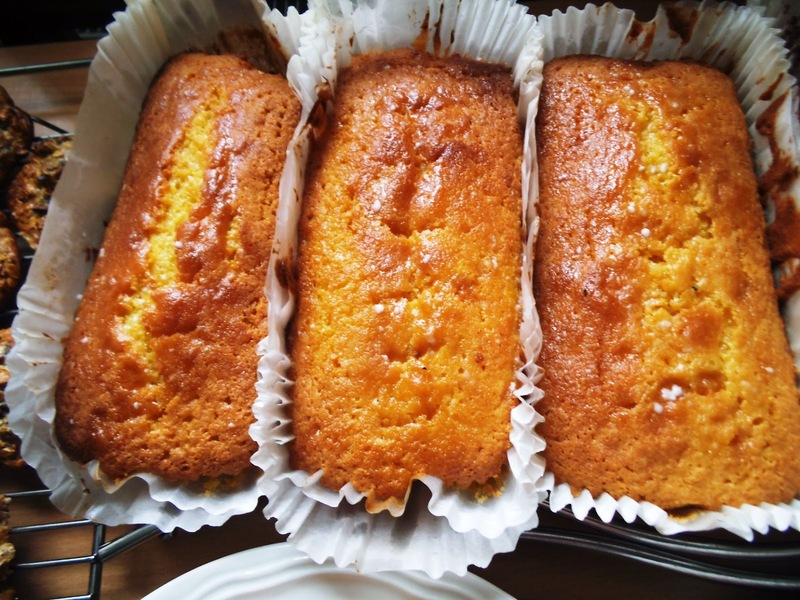 Your baking looks tasty, Holmsey is looking fantastic in his spring colours and your new start is looking wonderful. Would love to take part in your Mug Rug but wont have access to a machine for a little while. Maybe next time. Catching up on blogs. I love mugrugs but can't join this time. Looking forward to seeing the fun! I want to play!! I will do an exchange!! I am coming back slowly now!! Just let me know more!! I actually have not made any but I have been collecting patterns and just need to sit down and make some!! Hugs! Mmmm ice cream and cakes! And WOW! 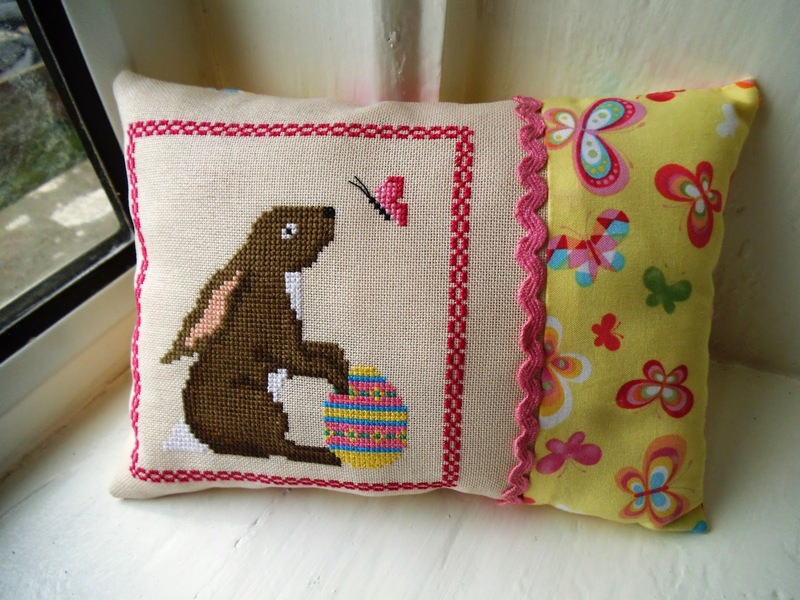 your stitching has blown me away again... love your holmsey pillow.. very cute indeed. And did you mention an exchange?? Oooh what is that all about? Love to know more! Well done to your son! That is so good to hear. 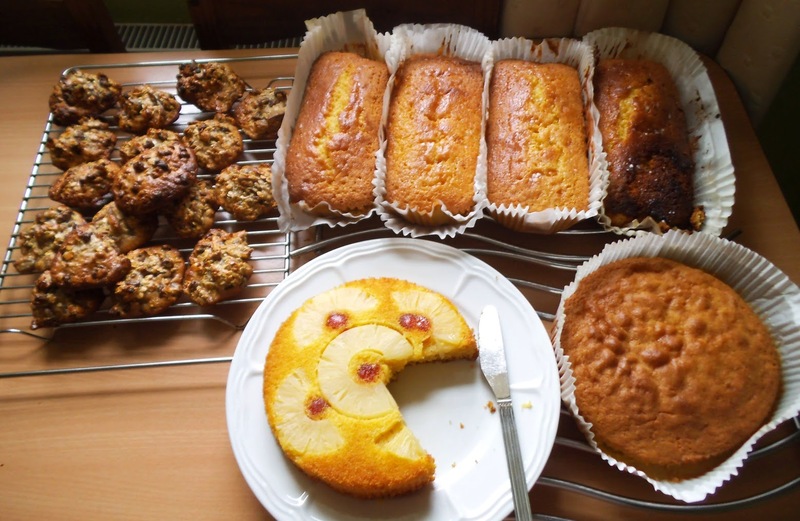 The baking looks fantastic! So yum! and I love Holmsey Hare. I would love to be part of the exchange and I am happy to send anywhere! Big well done to DS. Holmsey turned into a really lovely pillow. Yes, well done DS. God bless you and your sweet family. That is a lot of baking and it all looks lovely. But I love ice cream the most! Yum. Lovely the way the Easter piece is finished and your lovely new spring start! Congratulations to Xander on a good school report. It sounds like he is doing well. I would love to join the exchange but my sewing skills are not up to the level where I would want to make something for someone, so I will pass. I really need to learn to use my sewing machine properly. I'm sure it does much more than I can currently cope with. I've been so behind on blog reading and picked yours tonite to catch up on. I have to admit, I follow your posts on FB, but definitely prefer the blogs!! I had to stop and comment on this one. I laughed out loud at the assassin part and my 10 year old asked what I laughed at. I read him the paragraph and he laughed out loud and asked if he really said that. I told him yes, he said that was awesome and said he wants to meet him! Too funny ~ made my night. Please tell your son he has a fan across the pond!